1 Bedroom, 1 Bathroom, Full Kitchen. Back Door leads out to pool. Shared Community Swimming Pool. BBQ-Pits and lot of lawn chairs to enjoy some me time in the sun. Sleeps 4. Fully Equipped Kitchen with all your cooking amenities. This Unit sleeps 4. Fully equipped kitchen with all your cooking amenities. This cute efficiency sleeps 4. Swimming Pool at your back door. Community Shared Swimming Pool, BBQ-Pits. Community Shared Swimming Pool, BBQ-Pits. Community Shared Swimming Pool, BBQ-Pits. View from upper floor of Community Shared Swimming Pool, BBQ-Pits. Community Shared Swimming Pool, BBQ-Pits. Back door opens up to your back patio. View of Community Shared Swimming Pool, BBQ-Pits from upper floor. 1 Bedroom, 1 Bathroom, Fully Equipped Kitchen, Community Shared Swimming Pool, Queen Size Bed, Sleeper Sofa; Sleeps 4. This kitchen has all your cooking amenities. Fully Equipped Kitchen with all your cooking amenities. This Unit sleeps 4. This kitchen has all your cooking amenities. Small sitting area. 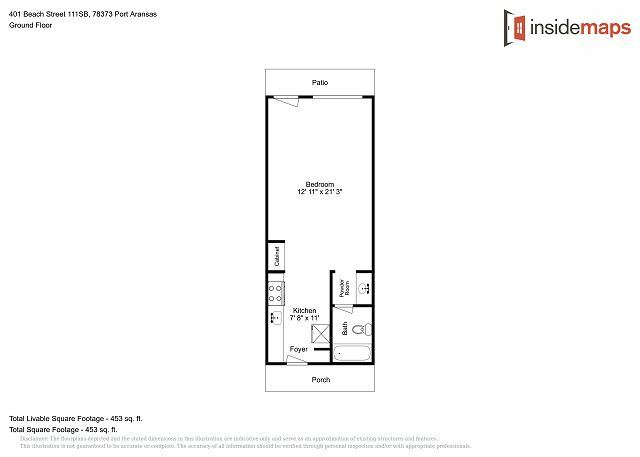 1 Bedroom, 1 Bathroom, Full Kitchen Efficiency, Sleeper Sofa. Sleeps 4 TV, Sleeper Sofa, nice sitting area. Back Door leads out to pool. Shared Community Swimming Pool. BBQ-Pits and lot of lawn chairs to enjoy some me time in the sun. Queen size bed, Sofa sleeper this unit sleeps 4. Swimming pool at your back door. Queen Size Bed, Sofa Sleeper, Sleeps 4. Sea Breeze Unit 111 1 King size bed, sleeper sofa, TV and Full Kitchen Efficiency. Sleeps 4 King Size Bed. Sleeper Sofa this unit sleeps 4. Queen size bed, Sofa sleeper, Back patio close to the Swimming Pool. Full Bathroom, Tub and Shower. Bathroom next to Bedroom area. Vanity Area, Full Bathroom Tub and Shower. Full Bathroom Tub and Shower. You will love this very nice updated condo that is located on the first floor of the Sea Breeze Condo Complex.It has 1 King and a sleeper sofa. You have complete access to the incredible pool area complete with hot tub, barbecue pits, and outdoor shower with beautiful views of palm trees and scenic landscaping. You’re only a block away from the Port Aransas beach and the South Jetty. All new appliances and fixtures. Ideal for a small family of 4 with everything you need to prepare meals in this property. No pets allowed and no smoking inside the unit. Laundry facility on premises. Limited parking to two cars per unit. To book after hours, call our office and press 9 and leave a message. Someone will call you back within minutes. Arrived after hours and it was so convenient to get room info. Checking out was a breeze. Even rented a golf cart last minute from them that was delivered to my door. Room was clean and so close to the beach. Pool was nice. Wish the hot tub would have worked though; water wasn’t heated. Either way I highly recommend this place! We are so glad to hear that you had a great stay with us. Thank you for the review. Please come back soon! A real value for the price. Well appointed. Clean and modern. Great location! Thank you for taking the time to give us a review. We are so glad that you had a great stay with us. We hope you will consider us again in the future. Our condo was clean and ready for us when we arrived. The air was on and did a good job keeping us cool. We enjoyed our stay and would rent at Sea Breeze again. Thank you for taking the time to give us a review. We are so glad that you enjoyed your stay with us. Please book with us again soon! This place was quaint and perfect for my young family if 4. The property was clean and lovely. Thank you for your review of SB111, glad to hear the unit was perfect for your family of 4, we think that is a great spot for a small family getaway, look forward to hosting your family again. We stayed at the sea breeze for the weekend, the day we checked in the room had a very strange smell. It was musky in the room and we found dead roaches in the floor. We were greeted by flies and a few mosquitos as well. We stay at the seabreeze often but this was the biggest disappointment yet. When we got back from the beach later that night my wife went into the restroom and grabbed a few towels for us. One of the towels that was folded and put away had blood spots all over it. There was old dry blood on the shower curtain as well. I thought it was very unsanitary for them to restock towels with blood stains on them clean or not. For $500 you would expect a little more when you stay some where, as I stated before we have stayed here and never come across an issues like this. I guess we just came at a bad time. We called to report our issue but all they suggested was to cancel our reservation and refund our money but this wasn't a solution we were looking for. I think they could have handled this in a better manner, the entire island was full so had we accepted this offer we would have had to leave Port Aransas completely just to get another room which we would have done but I had already rented a golf cart for the weekend and was there for a fishing trip. Aside from all this our stay was great in Port Aransas. Thank you for submitting your review, we have unfortunately fallen short on your expectations regarding this trip, we do clean all our towels and have a 2 step process to remove any stained linen from our inventory and if it's stained we removed them and do not put them back into the rotation, we must have missed that towel and we apologize, we did send our housekeeping manager over to clean the shower curtain for you when you reported it to us at the office, we understand that cancelling your reservation was not an option for you during your stay, this was a sold out weekend and did not have a replacement unit to place you or we could have offered something else, I have forwarded your review to my housekeeping manager and we will be discussing this with our housekeeping team, please allow us a second chance to come back to Seabreeze and see that we listened to your review and made the appropriate changes. First time at Sea Breeze Great experience! Very clean, nice furnishings, kitchen was well equipped, very roomy. Customer service from Life in Paradise was excellent! Pool and yard well maintained! Very pleased. Highly recommend!